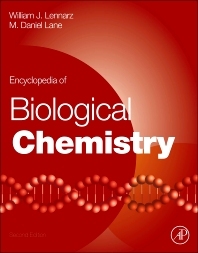 The 4-volume Encyclopedia of Biological Chemistry, Second Edition, represents the current state of a dynamic and crucial field of study. The Encyclopedia pulls together over 500 articles that help define and explore contemporary biochemistry, with content experts carefully chosen by the Editorial Board to assure both breadth and depth in its coverage. Editors-In-Chief William J. Lennarz and M. Daniel Lane have crafted a work that proceeds from the acknowledgement that understanding every living process-from physiology, to immunology, and genetics-is impossible without a grasp on the basic chemistry that provides its underpinning. Each article in the work provides an up-to-date snapshot of a given topic, written by experts, as well as suggestions for further readings for students and researcher wishing to go into greater depth. Available on-line via SciVerse ScienceDirect, the functionality of the Encyclopedia will provide easy linking to referenced articles, electronic searching, as well an online index and glossary to aid comprehension and searchability. What Do ARC Channels Do? How Are [Ca2+]c Oscillations Decoded? How Do DNA Glycosylases Attain Specificity? Adiponectin and Adiponectin Receptors as Therapeutic Targets? A Role for the PTP in Cellular Ca2+ Homeostasis? Are Some Calvin Cycle Enzymes More Important in Regulating Carbon Flux than Others? What Are Reactive Oxygen and Nitrogen Species? Can the Mitochondria Sense the Site of ROS Formation? Can Mitochondrial ROS be Controlled? Are Group II Introns and the Spliceosome Related? WILLIAM J. LENNARZ received his B.S. in Chemistry from Pennsylvania State University and a Ph.D. in Organic Chemistry from the University of Illinois. Subsequently he carried out postdoctoral work at Harvard with Konrad Bloch on fatty acid biosynthesis. In 1962 he was appointed Assistant Professor at Johns Hopkins in the Department of Physiological Chemistry. After promotion to Associate Professor in 1967, and full Professor in 1971, he remained at Hopkins until 1983. At that time, he was appointed Robert A. Welch Professor and Chair of the Department of Biochemistry and Molecular Biology at the University of Texas Cancer Center, M.D. Anderson Hospital. In 1989 he became a Leading Professor and Chair of the Department of Biochemistry and Cell Biology at SUNY at Stony Brook. In 1990 he founded and became Director of the Institute for Cell and Developmental Biology at Stony Brook. Dr. Lennarz has served on many national and international committees. He has served as President of the Biochemistry Chairman's Organization, President of the American Society for Biochemistry and Molecular Biology and President of the Society for Glycobiology. He was a member of the Executive Committee of the International Union of Biochemistry and Molecular Biology for almost a decade. He has presented special lectures at the University of Notre Dame, the NIH, the University of West Virginia, Johns Hopkins University, Florida State University, the University of California at San Diego, the University of Arkansas, Indiana University and the Medical College of Virginia. He is a member of the National Academy of Sciences. The focus of his early work was on lipids and bacterial cell surfaces. More recent efforts have been in the structure, biosynthesis and function of cell surface glycoproteins. The biosynthesis studies initially were carried out in liver and oviduct, but these efforts now are focused in yeast. The functional studies have concentrated on the role of cell surface glycoproteins in fertilization and early development in the sea urchin and, more recently, the frog. He served as Distinguished Professor and Chair of his department. He now is Distinguished Professor Emeritus. State University of New York, Department of Biochemistry and Cell Biology, Stony Brook, U.S.A.
M. Daniel Lane, Ph.D. is Distinguished Service Professor of Biological Chemistry at the Johns Hopkins Medical School. He received B.S. and M.S. degrees from Iowa State University, a Ph.D. degree from the University of Illinois and an honorary Doctor of Humane Letters degree, from Iowa State University. He did a Senior Postdoctoral Fellowship with Professor Feodor Lynen at the Max-Planck Institute Für Zellchemie in Munich. Following faculty positions at Virginia Tech and New York University School of Medicine, he joined (in 1970) the faculty at the Johns Hopkins Medical School where he served as DeLamar Professor and Director of the Department of Biological Chemistry from 1978 to 1997. He was elected to membership in the National Academy of Sciences and the American Academy of Arts and Sciences (1987) and as a Fellow of the American Society of Nutritional Sciences (1996). He received the Mead Johnson Award from the American Society for Nutritional Sciences and the William C. Rose Award from the American Society for Biochemistry and Molecular Biology and served as President of the American Society of Biochemistry and Molecular Biology. 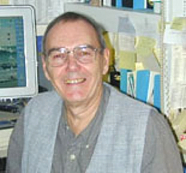 He served on numerous editorial boards including the Journal of Biological Chemistry and the Annual Reviews of Biochemistry. With William Lennarz he co-edited the first edition (2004) of the Encyclopedia of Biological Chemistry. Currently he is Associate Editor for Biochemical and Biophysical Research Communications. His early work focused on enzymatic CO2 fixation reactions, notably the mechanisms by which the B-vitamin, biotin, functions in carboxylases. His research on acetyl-CoA carboxylase, key regulatory enzyme of fatty acid synthesis, led him to his present interests in the basic mechanisms of lipogenesis, adipogenesis and the hypothalamic control of energy balance.